Fall is one of our favorite times of year, and there's so much family fun to be found in Marin and beyond. Find a family-friendly fall festival, fair or Oktoberfest to celebrate the season. 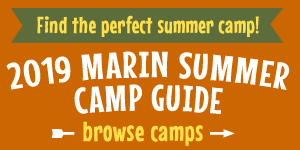 We'll keep updating our list of events for Marin and beyond as we find more this fall. If you have an event you'd like to see added to the list, please contact us. Enjoy German music, beer, and food, as well as free family rides and games. Playland of Sausalito will be sponsoring the kid's jumpee area with 5 awesome jumps, all free. The community apple press will again be pressing apples from Tam Valley. If you have extra apples to donate, please bring them, or we can arrange to come over and pick them, let us know. We hope to get you up on your feet dancing with the Golden Gate Bavarian Dancers. We'll also dance to the German sound of Deutscher Musikverein of San Francisco from 3:00-6:00 and closing out the night will be the great sounds of Big Lou's German Band from 6:00-9:00. Ticket prices are $20 per adult and $10 for kids 1-13 years old. Ticket price includes entry to the fest, the fun house and all the jump houses. Call for tickets at 415-388-6393. Event website. San Anselmo's annual Country Fair Day & Parade will take place on Sunday, September 30th, 2018. The event begins with a Pancake Breakfast at the Downtown Fire Station (8:00-10:30AM), followed by a Country Fair from 10am to 3pm (San Anselmo Avenue between Tamalpais and Tunstead Avenues), and Parade (begins at 11am and runs on "The Avenue" from Ross Avenue to Tamalpais Avenue). The event culminates with a Music and Food Festival in Creek Park (Noon to 3pm). Event details. Are you looking for an amazing event to enjoy with the whole family? Our annual Children’s Faire is coming up on Sunday, October 7. Admission is free ~ all are welcome! Come enjoy magical games, crafts, puppet shows, unique vendors and organic food. Event details. Bring the entire family to the annual Harvest Fest celebration! Taking place on October 5-7 and 12-14 this year the event will also be paired with Halloween themed happenings. Celebrate the changing of the seasons with events like our apple bobbing contest, fishing derby, face painting, pumpkin decorating, and more. Event details. Meet your farmers & vintners, shop from delicious farmstands, see how cheese is made, pick pumpkins, meet farm animals, learn about beekeeping, sample delicious food & libations and discover some of Sonoma County's best kept secrets! Register for this free event here. Bring the family to the 12th Annual Cotati Oktoberfest. Free admission, dancing, Authentic German Food, Authentic German Music, Wiener Dog Race, Yodeling Contests, costume contest and more... Location: La Plaza Park in downtown Cotati, Old Redwood Hwy. & W. Sierra Ave. Event details. Bring the family to the 2nd Annual Harvest Festival + Pumpkin Patch. There will be live music by The Bloodstones from 12 pm-3 pm both days, food, beer, hay bale pyramid and maze, kids arts, crafts, face painting, games, and lots of pumpkins. Succulent pumpkin centerpiece workshop (on Saturday, 10/20). Location: 23570 Arnold Drive, Sonoma. Event details. Stroll the Zoo in costume and collect yummy treats. Ride the spooky boo train and join the dance party. Plus, get your face painted, make treats for the animals, and see how the animals at Oakland Zoo celebrate Halloween. Kids in costumes receive a free ride ticket. Zoo admission applies. Event details. The ranch will host special tricks and treats during Slide Ranch’s Halloween Family Farm Day. Activities may include making costumes with recycled materials, face painting, taking a spooky tour of the Slide Ranch garden, investigating worm compost, and cooking up some tasty treats in the outdoor kitchen. Visitors will get a chance to practice trick or treating around the ranch. Costumes are welcome and encouraged! Tickets: $35 per person, children 35 months and under are free. Purchase tickets and event details here. Bring the family to the Corte Madera Larkspur Mother's Club 2018 Boo Fest (open to the public). Enjoy Tricks & Treats (including two bounce houses), magic show, pizza, wine and beer. Cost: CMLMC Members $30/family (RSVP by 10/19) or $40/family at the door. Non-member families: $40/family (RSVP by 10/19) or $50/family at the door. All-inclusive event cost per family, including pizza, adult beverages and children's entertainment! Bring cash to pay at door upon arrival. Location: 498 Tamalpais Drive, Corte Madera. Event details. Family Farm Days are exciting four-hour programs, 10am-2pm, featuring a wide variety of activities related to the day's theme. Discover Slide Ranch's feathered, furry and wooly friends with your whole family. Tickets: $35 per person, children 35 months and under free. Purchase tickets and event details here.